The Deluxe Tilt is a unique EQ that simultaneously boosts and cuts by shifting the EQ curve around a center frequency of your choosing. The result is a natural and effortless way to get a subtle or an extreme EQ setting with the turn of a knob. 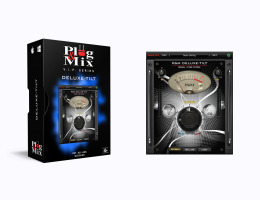 Use the Deluxe-Tilt to warm up or cool off a track to add contrast in your mix or add clarity where you need it. TILTING - Turning the knob to the right not only acts as a treble boost, but also a bass cut, while turning it left performs the opposite function. NORMAL - This mode has a narrow Q.
MELLOW - This mode has a moderate Q.
LUSH - THis mode has a wide Q.